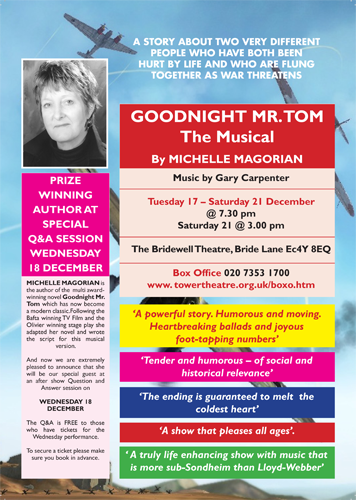 I’m happy to announce that I will be appearing at a Question and Answer session on the 18th December after the Tower Theatre Company’s production of Goodnight Mister Tom, The Musical. The Q & A session is FREE to those who have tickets for the Wednesday performance. To secure a ticket please make sure you book in advance! The shows are at 7.30pm on Tuesday 17th through to Saturday 21st December and there is a matinee at 3pm onSaturday 21st December. <<< Click on the poster for more details and to book a ticket. ‘Break a leg’ to the cast and company and hope to see you there with a question on the 18th.